Personal relationships are important for any business owner as they provide some respite away from the company and can help you de-stress effectively. However, these relationships are limited because you are only around family members and friends that you engage with regularly. On the other hand, professional networking helps you connect with like-minded individuals on a different level. Networking for startups is a great way to embed an entrepreneur into a community filled with resourceful persons that can help scale up your business. While flesh-and-blood relationships are helpful for an entrepreneur in many ways, it hardly gives you the edge that establishing a professional network promises. In your quest to successfully position your startup for accelerated success, there are times when you will need to have a chat with someone who has had similar experiences as yours, and that is one of the many benefits of networking. It is important to understand the role each person plays in the success of your business. This means you must know key contacts such as potential investors, partners, and customers. Knowing this will help you choose your spots wisely, looking out for events that expose you to crucial networking opportunities. If your business focus revolves around satisfying local markets, source for events and seminars where you are likely to meet influential customers, service providers, and B2B customers. Attending events that connect you with influential partners and customers should be a priority. During the course of an event, create some time to socialize rather than just listening to the speaker on your seat. This is an ideal opportunity to reach out to new people—look out for when they are standing alone, introduce yourself to them, and take it up from there. You can also consider hosting events for individuals who are crucial to the success of your startup as this will allow you develop deeper and fruitful relationships with new and influential people. Business cards are a great tool especially for startups. It is important that you bring them with you at all times & print lots of them and be liberal as you hand them out. Most importantly, utilize the space on the card as efficiently as possible—the message you have on your business card could just help you develop a fruitful and rewarding network for your startup. Your networking plan is incomplete if you are not actively and deliberately connecting with people online and offline. They are both very important and critical to your startup success. 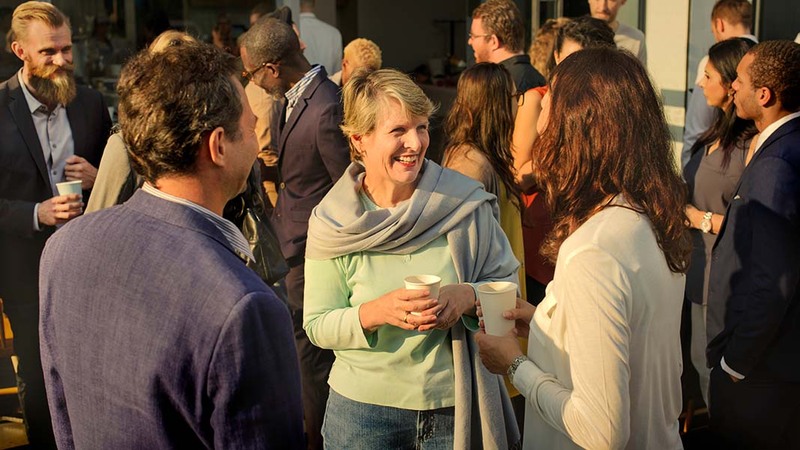 As you connect with influential people offline, search for online communities that connect you with contacts that share your goals and interests—and learn from the experience of entrepreneurs in the community. Keep in mind that the success of every relationship hinges on value exchange. This is true even in friendships. First, you must understand the value you can provide, considering what is important for other people, and come up with a twist that makes your offering unique. This can be especially helpful if you are a newbie in the industry. Meeting with the big players in your industry and asking for their thoughts and opinions is a great way to attract people to invest in your startup. And according to the Ben Franklin effect, the more effort an individual puts in your relationship, the more they will like you. When you meet such people, find out why they took out time to meet with you as this strengthens the idea that you are worth their time. Then ask them for recommendations—connections to influential players in their network that may be open to the idea of working with you. Be clear and precise with your requests and proposals. To ensure clarity in your communication and get it right the first time, try applying varying approaches. As people come from different cultures, backgrounds, and statuses, they will likely interpret your message differently. If your message isn’t clear enough after three to four sentences, it will likely be confusing and this will reduce your chances of getting the attention of anyone, so keep your message clear and simple. The connections we make every other day can yield some of the best experiences of our lives—and this is especially true for startup entrepreneurs. Entrepreneurship not only opens you up to opportunities that enrich you, but can prove beneficial for your company, its stakeholders, and your employees. Networking is a great way to develop collaborations and partnerships that solidifies the foundation of your startup and sets it up for future success. Mark Sands is the co-founder of High Risk Merchant Account LLC, a leader specializing in high risk merchant accounts. Mark enjoys writing on entrepreneurial topics with startup entrepreneurs in mind.